not even oriundo- calcio without citizenship: Daje Roma! For once, Italian football was not a spectator to someone else's resurgence, remontada, or, more fittingly after the last twenty-four hours, someone else's rimonta, the Italian and not the Spanish word for come-back. Overturning 4-1 deficits, 3-0 deficits, is the preserve of the Spanish and English. Think Deportivo and Milan. Think Milan and Liverpool in Istanbul. Think back to just last year when Barcelona did to PSG what Roma did to them last night at the Stadio Olimpico. Italian clubs are known for negotiating ties more than upturning them. But after last night, that reputation may start to change. Roma had to do the unthinkable: score three at home against Barcelona and keep Lionel Messi and Suarez from scoring. They did both, but it was the latter they did with supreme distinction. Barcelona were nowhere. Roma had accounted for every blade of grass on the Stadio Olimpico's pitch; everything was in their purview. 3-0 is what they had to achieve, and they did, stubbornly picking away at Barcelona until the Catalan club disintegrated. When Edin Dzeko scored, you thought, well, it's a matter of time until Barcelona would; when Daniele De Rossi smashed the penalty home, you thought now Barcelona would steal a goal; but when Kostas Manolas headed home for 3-0, the sought-after result, you knew Roma were going to achieve what almost no one thought they could. There are times when language betrays you because you have betrayed it in the past; you are out of superlatives, you are out of adjectives because you have squandered them in the service of less deserving occasions. At the final whistle yesterday, you thought to yourself, how do you describe something so utterly absurd? That is not to say that the result was a case of anything resembling fluke; no, what makes the 3-0 even more stupefying is that Eusebio Di Francesco legislated for Barcelona in every possible way. You saw the design. You saw the organization, but you still asked yourself, how could this happen? Roma players, hoarse from celebrations, told you how in post-match interviews, almost reprimanding you for not believing. They believed. They always had, they said. Juan Jesus. De Rossi. Radja Nainggolan, all of them had, and all of them had planned for this score. They had laboured for the miracle: this was no bolt from the blue. 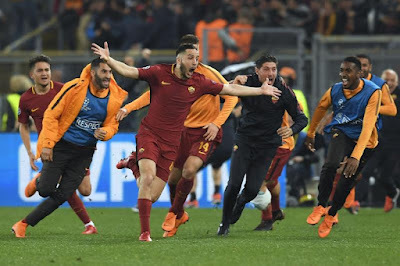 When Manolas ran to the bench after scoring Roma's 3rd in the 82nd minute, his eyes were open wide, unblinking, the spectacle washing over him, as he tried to take in every blur of flying limbs and screaming fans he could see. After the final whistle he walked around bare-chested, completely straight, shoulders pegged back. His celebration was emblematic of the win: Roma were colossal. Now, I hope for a repeat of the 1984 European Cup Final between Roma and Liverpool--and I hope for a different result.